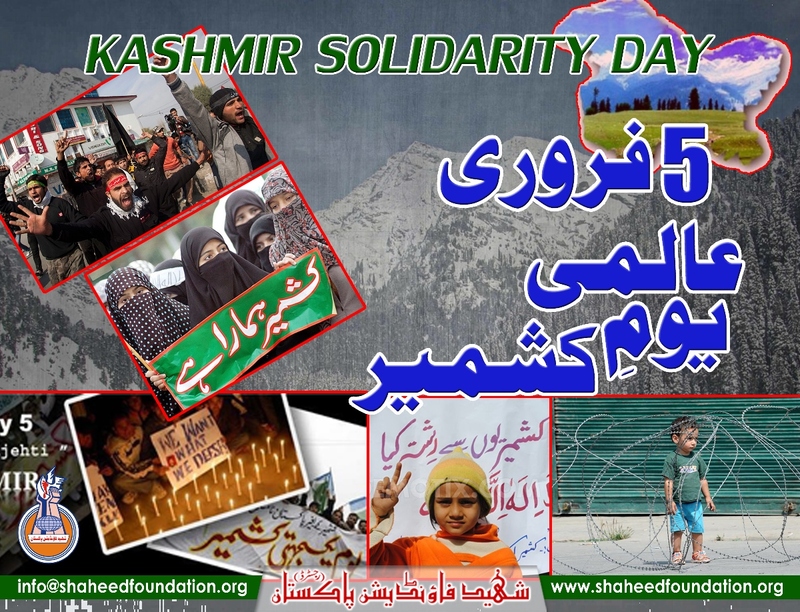 Kashmir Solidarity Day is being observed countrywide today to express unity and solidarity with the Kashmiri people. National public holiday has been announced for today and nation is marking this day with a spirit to urge the world to resolve the outstanding issue of Kashmir in accordance with the wishes and aspirations of the Kashmiri people and bring their decades long suffering to an end. Special programs would be convened on this occasion. This year 's Kashmir day is of special significance because of the increasing diplomatic ties of the joint enemy of Pakistan and Kashmiris ,namely India and Israel. It should be mentioned here that February 5 is officially observed every year in the country ever since 1990, as the then government decided to internationalize the Kashmir issue to draw attention of greater part of the world towards its importance and the need to resolve it. This day is meant to court support for Kashmiris braving India's injustices and brutal suppression. Kashmir's leaders highly value this sincere support by Pakistan. Cultural programs are organized around the country to highlight the importance of February 5. Special ceremonies are held at education institutions this day. A memorandum is presented to the UN office on this day. On this day, Kashmiris living across the globe are looking forward to the United Nations for the right of plebiscite. Pakistani people are standing by the people of Kashmir with political, diplomatic and moral support. It may not be out of place to mention that the Kashmiri people have been suffering the worst genocide at the hands of Indian Army ever since it invaded Kashmir in 1948 with the connivance of Dogra Raj. Pakistan's nation has through thick and thin stood shoulder to shoulder with Kashmiri brethren ,irrespective of any political considerations as there are bonds of religious brotherhood that tie the two people together and in the words of Quaid-e-Azam Mohammad Ali Jinnah ,Kashmir is Pakistan's jugular vein. The beautiful land of Kashmir has been peacefully struggling till 1989 when the Kashmiri leadership decided to fight back the aggressive designs of Invaders and has offered hundreds of martyrs on this glorified path ,while many more are dis-appeared ;often traced back to state dungeons in the occupied Kashmir and India . It may not be out of place to mention that the beautiful valley of Jammu and Kashmir and it's adjoining areas house a significant majority of Shia muslims as well as Holy Sites housing tabarukat belonging to the family of Rasool-e-Khuda[SAWW]. The ideological father of Islamic Revolution and the Supreme Islamic jurisprudential authority of his times Rahber-e-Kabeer Imam Khomeini's ancesters also belonged to Kashmir,where from,they migrated to Khomein. "Look how everywhere in the world where there is a Muslim community, they receive a much harsher treatment compared with others. Kashmir is a contemporary example for this. Muslims there speak out their rights. Anyone who is informed of what Kashmir has gone through, knows what Muslims of Kashmir express is nothing but truth and justice. Those who silence them have an unjust cause. Those who attack them are the ones who are doing the wrong action. Sadly the world watches all this in cold blood. "